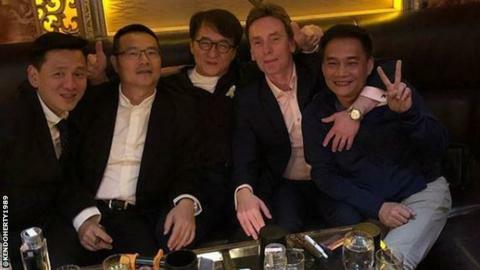 Resurgent former world champion Ken Doherty revealed he sang karaoke with legendary martial arts film star Jackie Chan in Hong Kong last week. The Irishman, 49, met 64-year-old Chan at a charity night at which they sang and played snooker trick shots. "He's great company, just as you see him on screen," Doherty said. "He loves a sing-song, just like the Irish." Doherty applied a lethal touch against current world champion Mark Williams on Tuesday to make the China Open last 32. Recalling his night out with screen icon Chan, the 1997 world champion, who won the last of his six ranking titles in 2006, added: "It was one of the best and funniest nights I've ever had." Doherty, who had to cancel a booked flight home because of his surprise victory over Williams, faces Ricky Walden in the next round and hopes his positive experience in China will boost his chances of qualifying for the World Championships. "I would love to play at the Crucible one more time, to say thanks for the memories and this is my last time," said the Irishman, who has reached the last 32 for the first time this season. "It will be very tough to come through the qualifiers, but I'll go there with more confidence and a spring in my step. I don't think many players would want to draw me there."